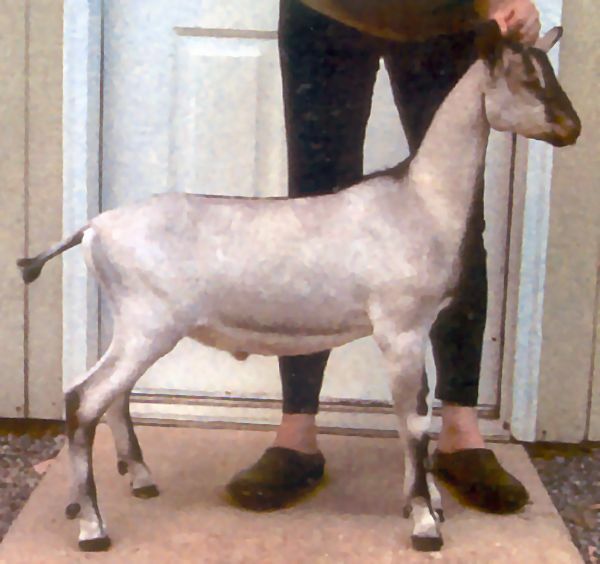 Notes: LA is Linear Appraisal, a service provided by the American Dairy Goat Association to classify animals. Scores are listed by age (years-months), final score (of a maximum 100, highest live goat is a 95), then a letter to indicate General Appearance, Dairy Strength, Body Capacity, and Mammary System (E is excellent, V is very good, + is good, A is average, F is fair, and P is poor). DHIR is Dairy Herd Improvement Registry. Lactation information is provided to include age (years-months at freshening), days in milk, lbs milk produced, % fat, lbs fat produced, % protein, lbs protein produced, (ip) indicates the lactation is "in progress". Medesima is long and extremely dairy. 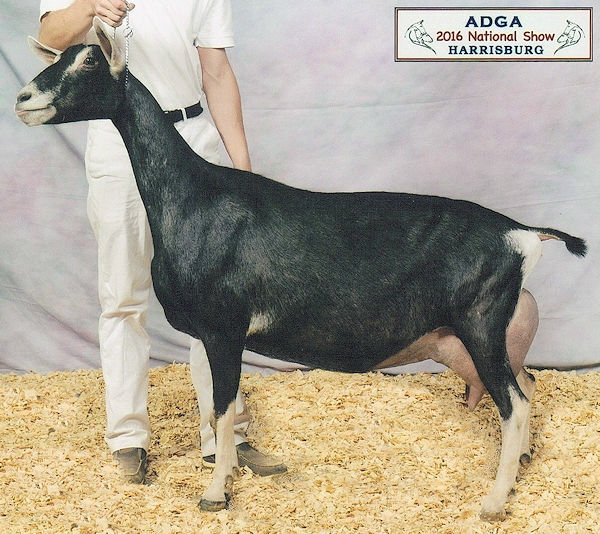 In her first show as a yearling, Medesima placed 2x1st with 1st udder in classes of 16! Several judges described her as a very balanced and complete doe, and complimented her front end assembly. Her udder is snugly attached, and she has just gotten better with age. 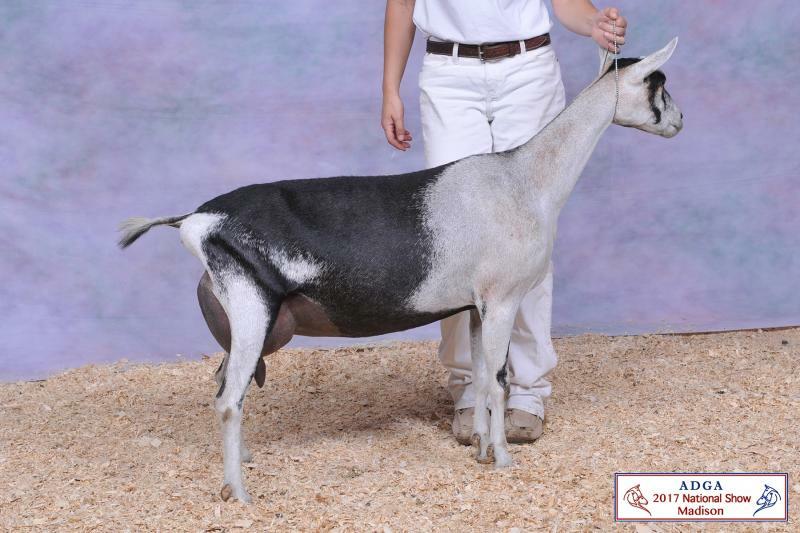 She finished her permanent championship at the 2013 WYDGA Fuzzy Show, and won Best Doe In Show in 2014 at age 6, with two more BDIS wins in 2016, one in 2017, and one in 2018! 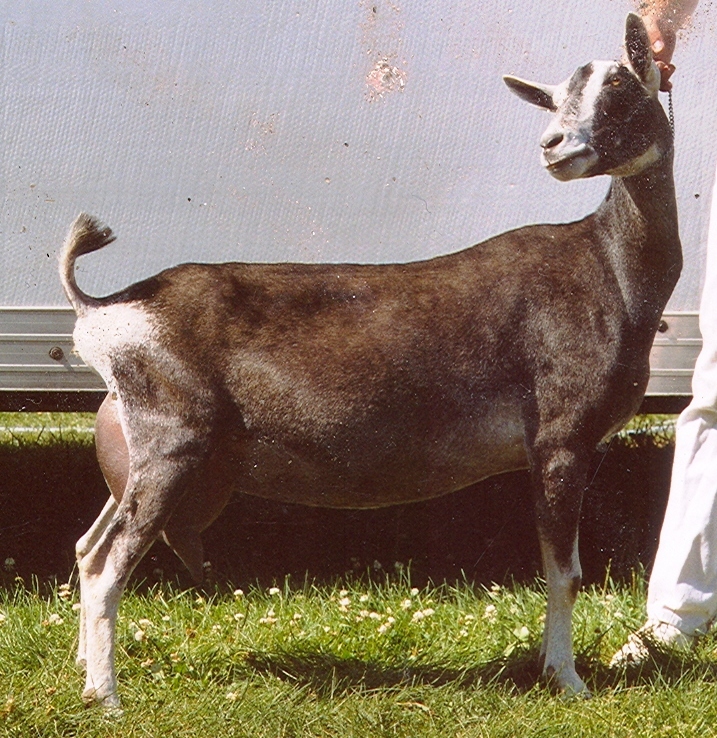 Medesima is holding up beautifully as she ages--particularly in the strength and correctness of feet, legs, topline, and udder attachment--she epitomizes the quality coupled with the longevity I strive to attain with our does, as confirmed by her 92 EEEE appraisal score as an 8 year-old doe. 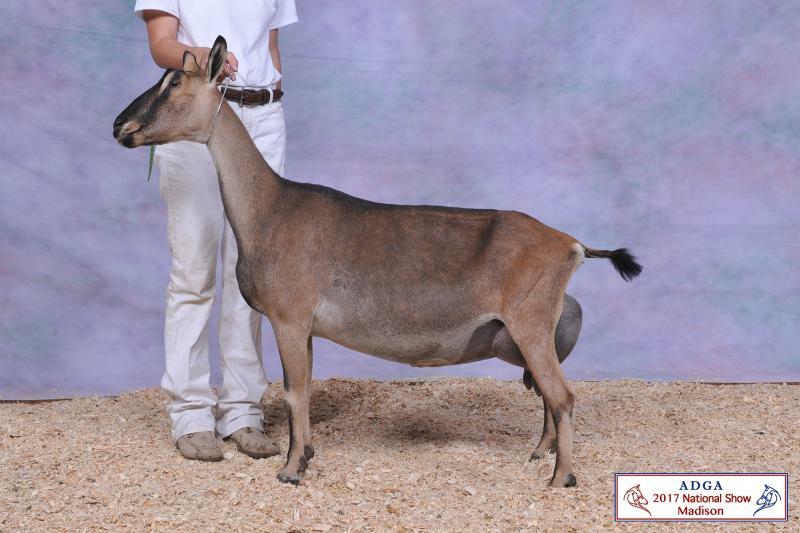 We are pleased with her 6th place finish in the aged doe class at the 2017 ADGA National Show in Madison. Her daughter by *B Mamm-Key Zephyr's King Julien, GCH Magdalene, and daughter Madeira, by CH *B Chateau Briant's Bon Idee, remain in our herd. Breeding Plans: If bred for 2019, Medesima will be AI'd for late season kids to *B Chairein S Blackstar. Photos [l-r]: Medesima as a milking yearling, at age 5, and at age 8. Tigress as a 6 year-old. Tigress joined the herd in May of 2017. We had previously shown against her in Colorado and Wyoming, admiring her tremendous fore udder, topline, and rump, not to mention her presence in the ring. 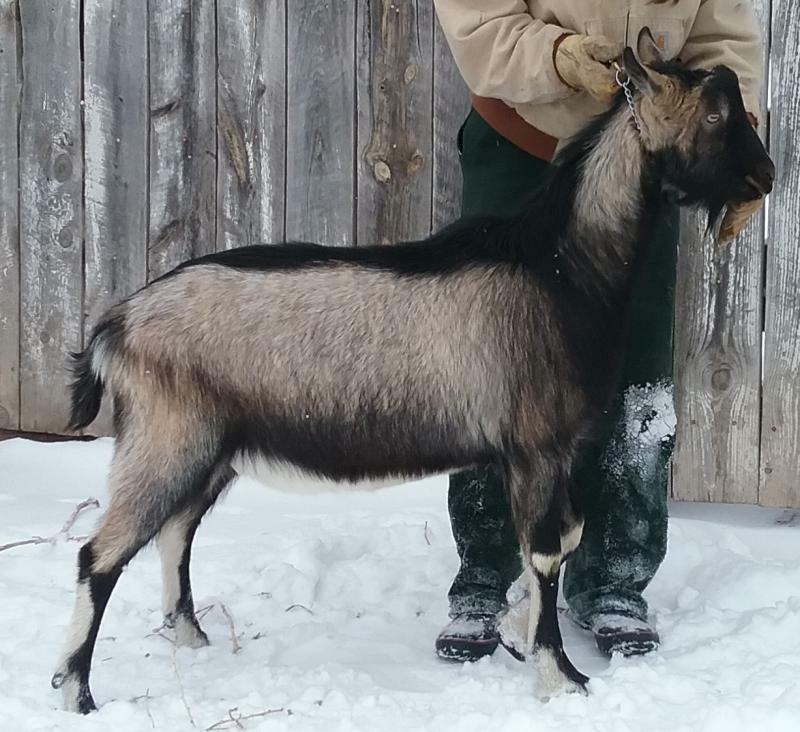 In 2016, we had the opportunity to obtain her buck kid, Trumpcard, to add to our French Alpines. 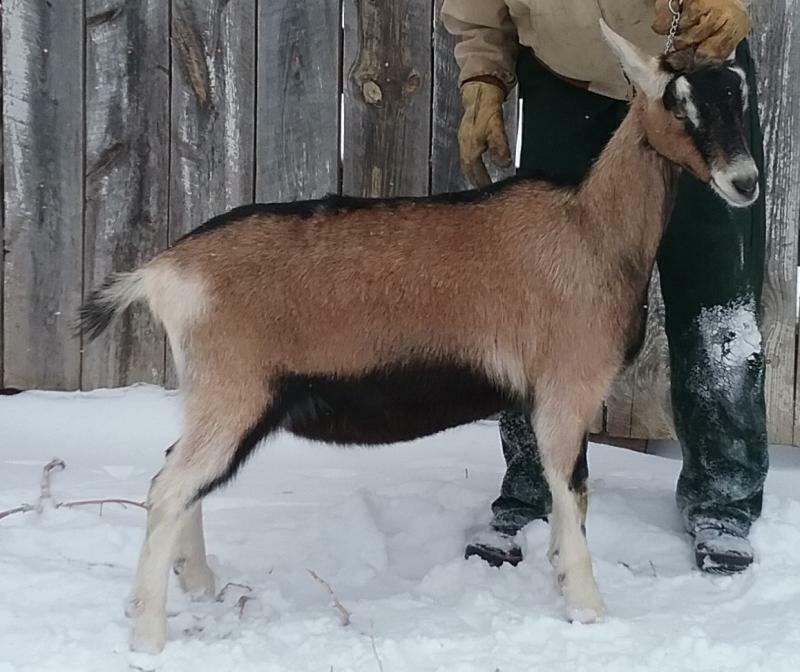 In 2017, we jumped at the chance to buy her, filling in a gap in the ages of our does, and adding a strong all-around doe to our show and breeding line up. Since joining us, she has won a Best Udder of Breed, and was the 4th place 5 & 6 year old milker at the 2017 ADGA National Show. We are very grateful to Linda Johnson and Sherry Barnes of L & S Alpines for allowing her to join us in South Dakota. 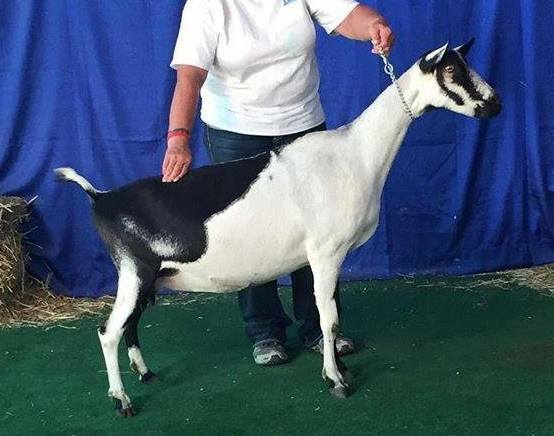 Breeding Plans: 2019 kids by Iron-Rod IRS Shyne On. Below: Tigress's dam, GCH Pearl Valley MMF Traza 3*M (Photo courtesy of L & S Alpines), and at right, Tigress at age 4. Blythe lives up to her name meaning: "happy." She is eye appealing, she is correct, she has genetics that endear her to me (a Medesima great-granddaughter!). 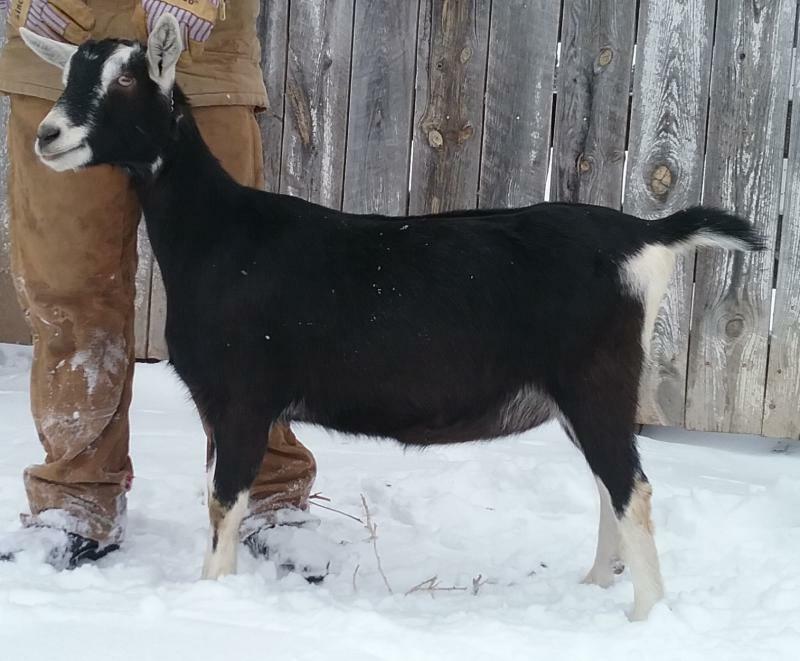 Everyone here loves to milk her by hand, my daughter can show her, and she is my husband's favorite goat! She couples that with a gorgeous rear udder view and productivity. She is really an all-around package. She is among the top 10 polled Alpines in performance(considering show, PTI, SG, LA, and DHIR information) in the last 10 years. 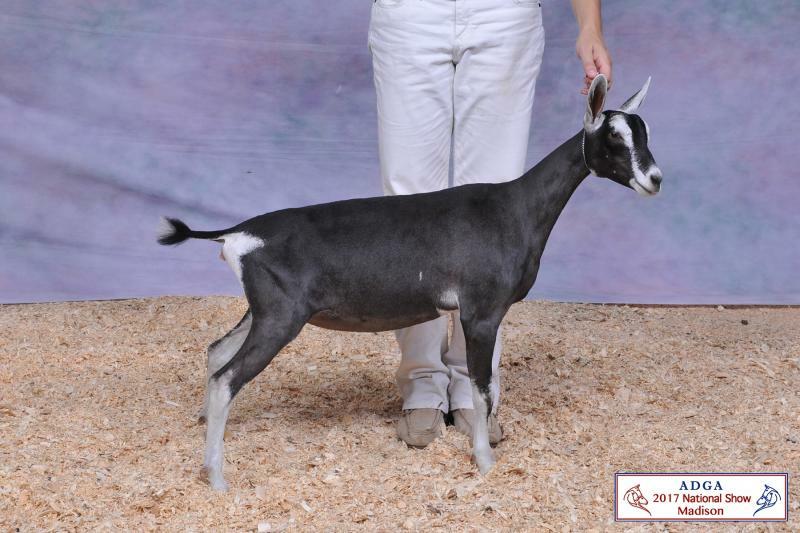 Breeding Plans: Planning an AI breeding to *B Chairein S Blackstar for 2019 kids. Photos on left: Itipaw Sagebrush Z Buttercup 5*M 2 year-old, FF; and SG Dawnwind Magnificently Clever, yearling. Photos on the right: Blythe as a 7 month-old kid and rear views as a 2 year-old and yearling milker. "Legs" is tall, long, and elegant. She has gone through some immature phases, and is now coming into her own. She is a very striking doe both in color and in style. She has the long bone pattern from both Shamison (and that family includes his littermate sister Iron-Rod Jim Shimmer 7-01 92 EEEE and two permanent champion daughters) and Shatte. We were so impressed with Shatte during our visit to Iron-Rod, Legs was an easy decision to bring here. I am so grateful to Leslie for sending this doe to us. It appears that her genetics are compatible with our herd, as I am very pleased with her daughters Leprechaun, Lily, Lyrix, and Lepidoptera. Her son Dawnwind Singed Lincoln was used here as a junior herdsire in 2016, and we are excited about his 2017 kids. After a hard 2017 kidding, Legs was dry and not shown in 2017. Another hard spring in 2018 leaves Legs with low milk production, and several health issues. We hope for her improved health in the future. Breeding Plans: Legs will remain dry for 2019. Above: Milking yearling Legs (8 hours of milk) and as a 5 month-old kid. At right: Legs as a 2 year-old 2nd freshener. Magdalene is very smooth, has the length, the dairy and the strength, and walks with grace and elegance. Her udder came in full, and socked-on. She continually catches my eye in the pen--definitely a favorite. Her full brother, Mahogany, was one of our herdsires, so I am very pleased to see their offspring mature. 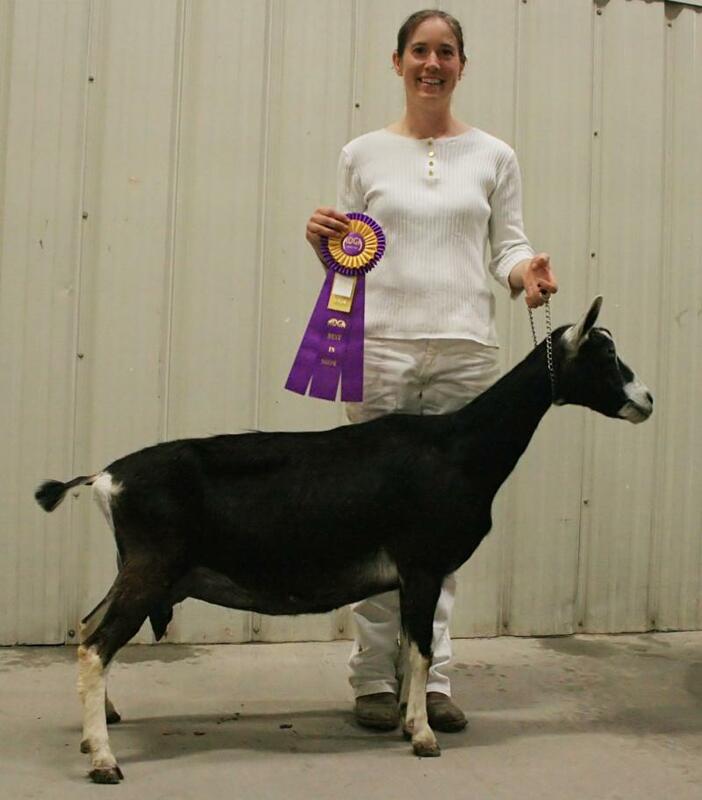 She placed 16th Milking 2 year-old at the 2017 ADGA National Show. Her daughter Magnolia, by Lincoln, was 3rd place Junior Kid at the 2017 National Show, and remains with the herd. Breeding Plans: Planned AI breeding to *B Chairein S Blackstar for 2019 kids. ﻿ At right: Magdalene's rear view at 2, as a milking yearling, and side view at 9 months of age. Above: Magdalene as a yearling, and at age 2. Below: Magdalene's parents: *B Mamm-Key Zephyr's King Julien (age 3) and SGCH Dawnwind Magnifique Medesima 3*M (age 6, milked out). We really like our buck, Trumpcard, so when the opportunity came to add a paternal half sister, we decided to give Belize a try. Her sire, Sass ties us back into Qu'Appelle V Ember and Iron-Rod lines, and his dam is a full sister to the Premier National Sire GCH +*B Windrush Farms IRS Charmer 4-06 89 VEV. Thank you Sherry and Linda! Belize was dried up early in 2017, so she was not shown or on milk test. She lost the use of 1/2 her udder, but is proving to be a nice brood doe. In 2018, was able to be appraised and on DHIR for part of the year. Jetski, named by my 4 year-old daughter, is a solid, all-around doe. Her udder is very snugly attached, and she is very easy to milk. She shows tremendous body capacity, and is long and very level. Breeding Plans: 2019 kids by CH *B Chateau Briant's Bon Idee. 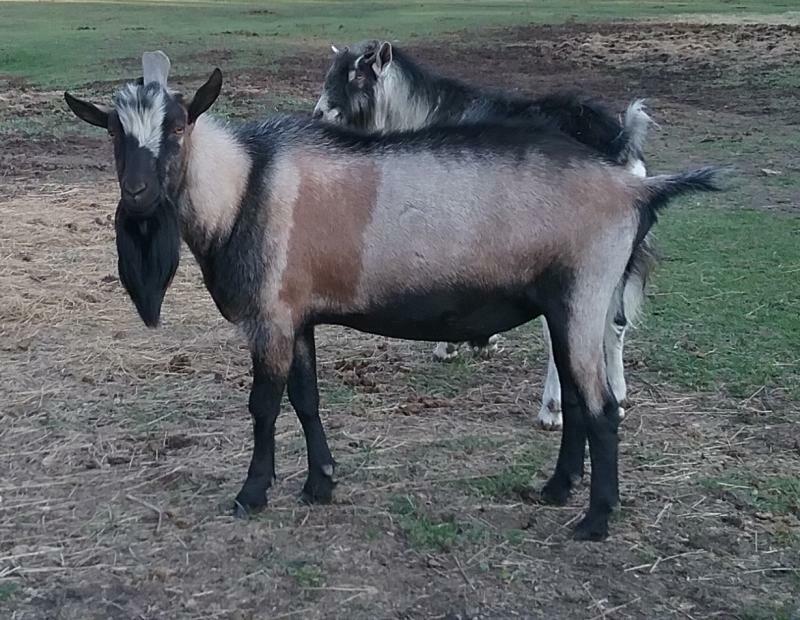 Photos: Jetski's parents: *B Dawnwind KJ Mahogany (age 2) and Dawnwind Magnificent Javotte (3 years), Below: Jetski at 9 months, and her yearling rear udder and side views. Third time's the charm on this breeding: finally, we have a doe from this cross! Like all the Bon daughters, she is long, strong, dairy, and smoothly blended. Her udder is very correct, productive, and easy to milk out. 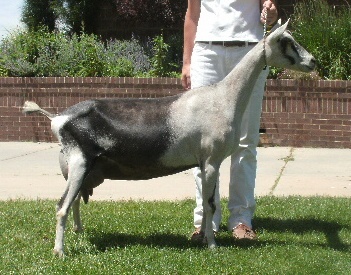 Madeira suffered some mineral allocation issues before her first kidding, which has affected her development. 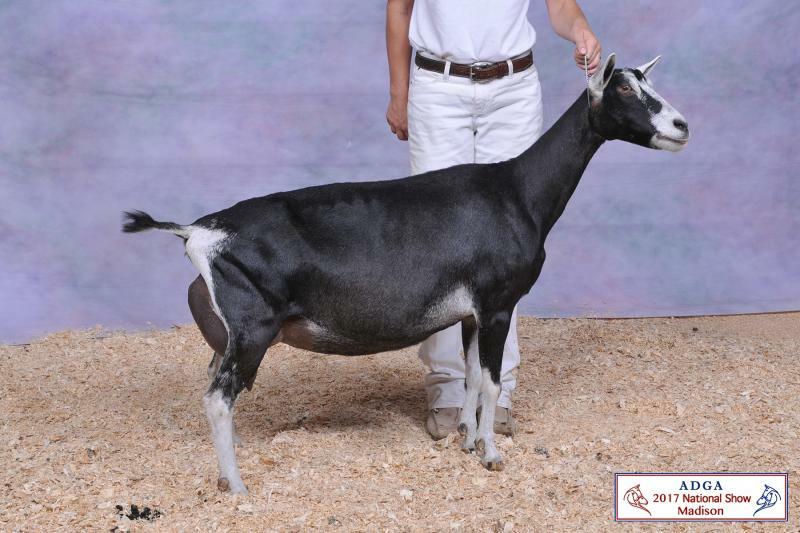 Breeding Plans: Planning on Iron-Rod IRS Shyne On for 2019 kids. Photos: Madeira's parents: CH *B Chateau Briant's Bon Idee (age 3) and SGCH Dawnwind Magnifique Medesima 3*M (age 9), bottom row left-right: Madeira at 9 months, 3 months, and her yearling udder. Melvyna is strong and smooth, with a particularly wide and flat rump. She has a quirky personality--always getting into trouble and looking to be pet. Her udder is rock solid, with a lovely medial, and good teats. 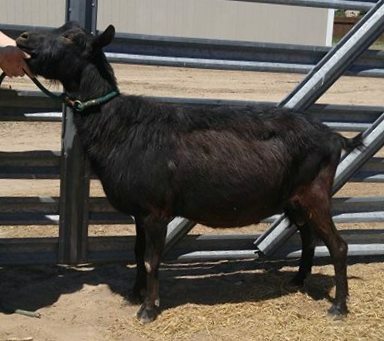 Breeding Plans: AI to *B Chairein S Blackstar for 2019 kids. Photos of Melvyna's parents: *B Dawnwind KJ Mahogany (2 years) and SGCH Dawnwind Ideal Marvelle (3 years). Lyrix is dairy, tall, and angular. I expect the topline and rump to be a highlight of this cross. She is very sweet-tempered. Her udder has come in very nicely, but not full as she kidded about a week early. Now just waiting for her to increase in capacity. Breeding Plans: Iron-Rod IRS Shyne On for 2019 kids. Below: Lyrix's parents: Iron-Rod SHM Show Some Leg 1*M (2 years), and CH *B L & S Alpines Tigres Trumpcard (yearling). Lyrix's rear udder as a yearling. Lyrix as an intermediate kid. I admit that a broken sundgau catches my eye, helping Magnolia to remain a keeper. 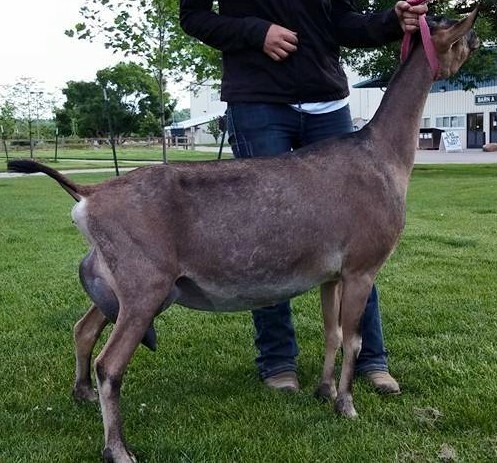 This doe kid combines two lines that I think are incredibly strong--longevity and balance from Medesima, a beautiful udder in Magdalene, uphill and smooth topline from KJ, lovely balance to the head from Singed, and elegance from Legs. 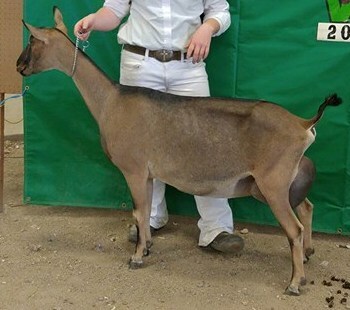 Others were also impressed with this doe, as she won her dry leg as a junior kid, and then placed 3rd in the Junior Kid class at the 2017 ADGA National Show. Magnolia has freshened with a very high, tight, and correct udder. 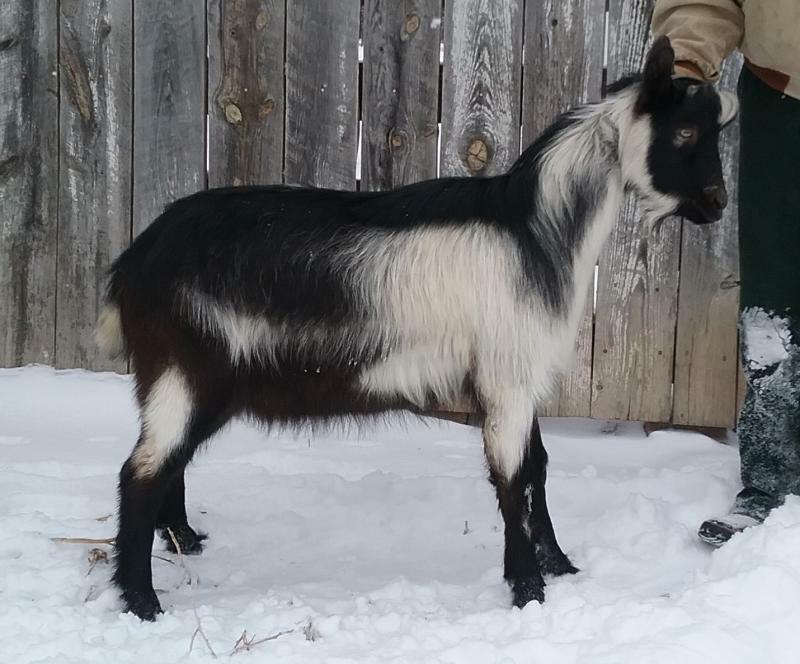 Breeding Plans: AI to Chairein S Blackstar for 2019 kids. Below: Magnolia's parents: GCH Dawnwind KJ Magdalene (2 years old, after winning her first GCH leg) and *B Dawnwind Singed Lincoln (yearling). ﻿Yearling and kid shots of Magnolia.